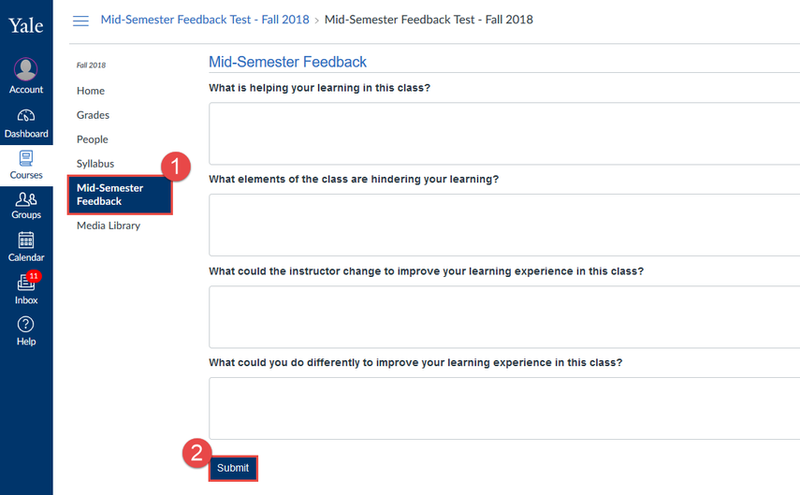 At a predetermined date around the middle of the semester, the Mid-Semester Feedback tool will automatically appear in the course navigation menu in your courses and will be available for you to submit course feedback. All students will have one week to complete a feedback survey for each course you are taking. After the survey is closes, the Mid-Semester Feedback tool will be removed from the course navigation. NOTE: Please be aware that some instructors may collect feedback using an alternative method. Instructors who do this may turn off the Mid-Semester Feedback tool in their Canvas course. NOTE: If you are taking multiple classes, you will need to submit a separate feedback survey in each course site. NOTE: You will only get 1 submission per course. You may want to write out your answers to the questions before you go to the survey tool to submit your comments. NOTE: Only users with the role of “student” or “auditor” in the course can submit feedback. Go to your current semester course site. In the course navigation bar, click the “Mid-Semester Feedback” button . On the next page, you will be able to enter your feedback. Your comments are strongly encouraged for each question, but it is not required that you complete all questions to submit. REMINDER: You only get one chance to submit your comments, so please make sure that your survey is complete before you click “Submit”. 5. When you have completed your survey, click the “Submit” button . 6. Repeat steps 2-5 for all courses you are taking in the current semester. REMINDER: Some instructors may choose not to use the Mid-Semester Feedback tool If you are not sure, check with your instructor to see if they intend on using the tool.